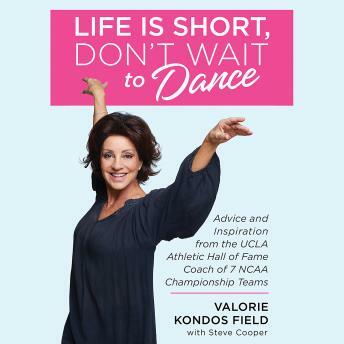 Listen to "Life Is Short, Don't Wait to Dance: Advice and Inspiration from the UCLA Athletics Hall of Fame Coach of 7 NCAA Championship Teams" on your iOS and Android device. Former professional ballerina Valorie Kondos Field-or Miss Val, as she's affectionately known-has never even tumbled, flipped, or ever played any type of organized sports and yet she has been able to craft a legendary coaching career through curiosity, creativity, attention to detail, and unwavering care for the overall well-being of her athletes. For Miss Val, it's not about winning and losing, it's about choreographing your life and owning the choices you make. Miss Val has shaped her UCLA Gymnastics program as a life skills class and now she's sharing those lessons with you, whether you're an athlete, business leader, or simply someone who wants to own their destiny. Miss Val's philosophies are timeless. Her coaching style is unorthodox. Life Is Short, Don't Wait to Dance is a thought-provoking, fun journey through the personal stories and anecdotes of the 35-year career of a dancer/choreographer turned athletic coach. Included are Miss Val's favorite memories of her mentor, legendary basketball coach John Wooden, as well as unforgettable stories of the Olympians and athletes with whom she's worked.